This hair tutorial might be my favorite yet. (I know I say that every time. Now it’s just extra true.) And not just because Chloe is rocking a faux version of the haircut I sport on the daily, but because it’s such an effortlessly edgy look for ladies with curly hair. And let’s face it, the words effortless, edgy, and curly seldom go together in the same sentence. 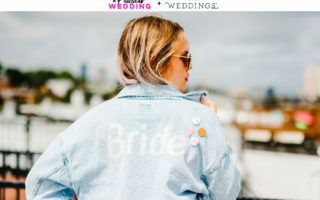 Plus, for those of you who like to stay on the cutting edge (i.e., the word timeless isn’t in your wedding vocabulary), the asymmetrical thing is very in right now. Don’t Wash It: Don’t wash your curly hair every day. Shampoo dries out curls (I know there are some curly haired ladies in our readership who swear by not washing their hair ever and I want to hear from you guys). On days when you don’t wash, Yesenia recommends using conditioner instead. I thought this was going to make my curls really heavy, but it just makes them soft and manageable. Use A Diffuser: If you’re going to use a blow-dryer on your curls, a diffuser will keep them from frizzing out. Yesenia also recommends investing in a good blow-dryer. For those of us who don’t have a few hundred dollars to spend, BaByliss has a good line of semi-professional hair dryers in the $50 range. Curl Cream: Yesenia recommends finishing this look with curl cream, but you can also use a dollop on your damp hair to help shape curls. Just squeeze out a small amount, warm up between your palms and then run through your strands. Keep reading below for our recommendations on which curl creams are best! Once you’ve prepped your curls, the key to getting this style to look edgy rather than messy is to give yourself a nice deep part before creating your French braid. I’ve affectionately come to refer to it as the 90s side part, because it’s far enough over that you’ll end up having to flip a bit of your hair to the other side a la Donna Martin (which, not that anyone’s asking, I killed in the fifth grade. But actually, this is a pretty good example of how far over you want the part to be). And there you have it! An edgy cheat to achieving the side shave asymmetrical look all the kids are wearing these days. And the best part? You can easily adapt this to fit longer hair, or even give it a try with straight or wavy hair. (I think some long voluminous waves would look rad with this look.) Also, as someone who has had trouble managing their curls for, um, ever, I find that the asymmetrical look is very forgiving. So if you have unpredictable curly hair that doesn’t usually behave, I say lean into it and take advantage of the fact that this style looks great with a little bit of wildness to it.